Wildlife…check. 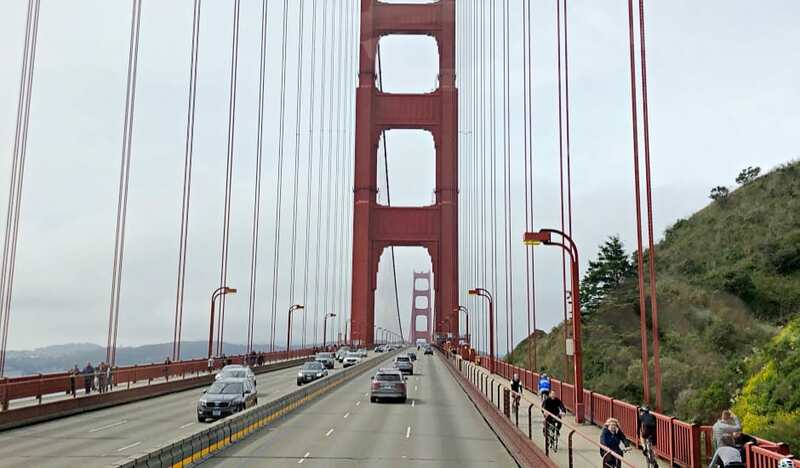 Incredible sights…check. Escape from the blaring heat that plagues the US in the northern summer…check. Fairbanks is one of the furthest north “cities”, it has a population of 30,000 in the city, 100,000 in the borough, then as many as 400,000 visitors throughout the year, more specifically during cruise season with a multitude of cruise tours taking passengers inland to the second largest city in Alaska. you can even take the riverboat down the Chena river with Riverboat Discovery. The Riverboat Discovery was voted the number one boat tour in North America and I can honestly see why. The 3 hour long journey is a unique blend of sightseeing and history. 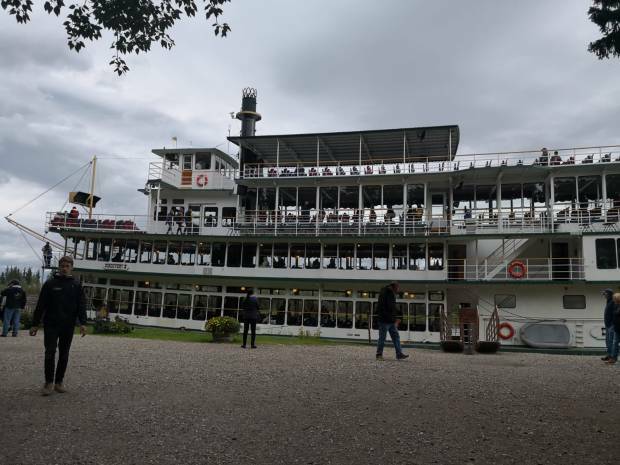 From the moment you board the mammoth 4-story paddle engine ship (the kind you would expect to see barrelling down the Ol’ Mississippi), it will tell you the story of modern life, native life, and history by appealing to nearly all your senses. Be forewarned though, it is an optional shore excursion for the cruise ships and it can get busy. 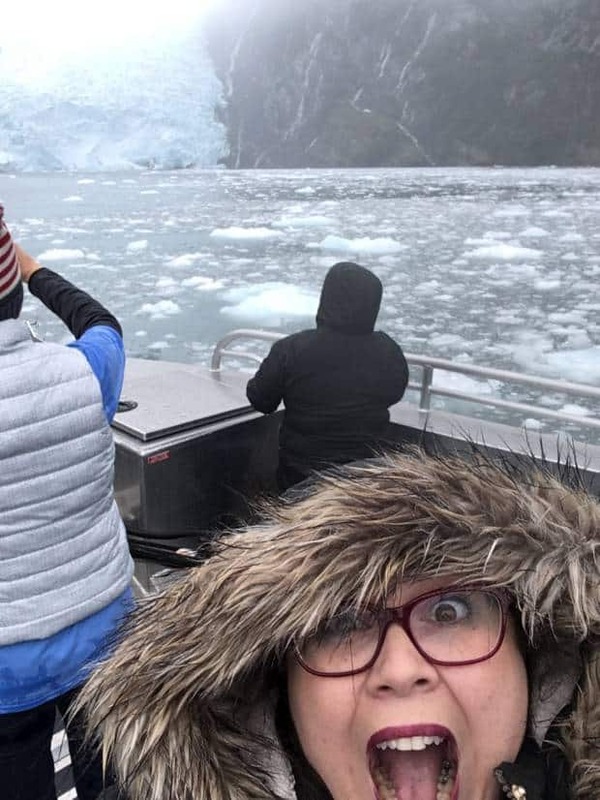 When you think of Alaska, you almost certainly get a picture in your head of Eskimos being pulled through the frozen tundra by big, bulking, white husky dogs. 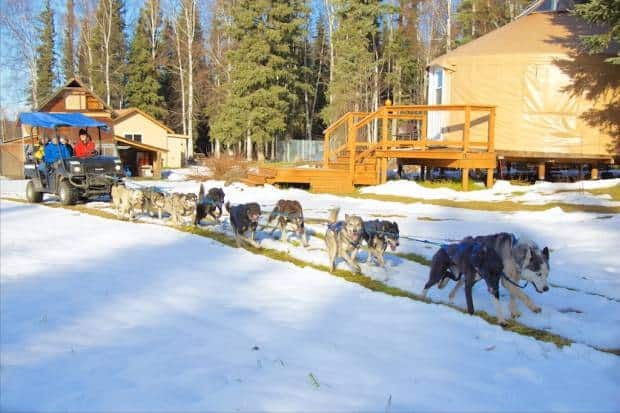 While dog sledding is a big thing in Alaska (if you don’t know about Iditarod yet, you will once you go) there are a lot of misconceptions about the sport that tour companies like Just Short of Magic seek to dispel. Located just outside of Fairbanks, we got to meet with the owner and dog-sledder of Just Short of Magic – Dog Sled Tours and Yurt Stay B&B. They told us all about the sport from what the dogs eat, to what makes an American Husky. As if that’s not enough, dog-lovers can rejoice because then you get to meet the dogs! If you’re scared of dogs though, you may want to give this a miss since she does have about 40 large pups! Looking at Fairbanks on a map, you’ll get a good idea of just how far north it is. Only 1% of the worlds’ population has actually crossed the line that defines the Arctic Circle. Through a small flightseeing aircraft from Fairbanks you can join the very few who can boast they’ve been to the very north of the world. The flight lasts about an hour and will land in a local village north of the latitude lines. The company we used, Northern Alaska Tour Company, boasts multiple itineraries to see life in the arctic. We had originally planned for the Arctic Circle Adventure to Coldfoot, but weather conditions meant a last minute change to Fort Yukon. Safety is the #1 concern, so don’t get your sights set on the itinerary you chose because if you don’t have days to wait around for the weather to clear then you’ll be put on another itinerary. When you cross into the Arctic Circle there’s no banner saying ‘welcome’ but if your pilot is anything like my 22 year old Maverick, then he’ll make an announcement at least. When we landed in Fort Yukon a lot of my group were taken aback by what they saw. In these towns the populations are likely to be triple digit (Fort Yukon was about 550 according to the 2016 census) and it was very desolate and poverty stricken since their resources are few and far between- the guide had even mentioned that it was an 88% unemployment rate. Don’t expect to see any hotels, food chains, or anything like what you’re used to because you will be in for a bit of a shock. Speaking of the far north, don’t forget to visit Santa Claus in the North Pole! No, you’re not actually going to the North Pole but you are going to North Pole, Alaska just outside of Fairbanks. The Santa Claus there is the real thing- not only did he look the part but he also sounded and acted the part too. I actually had to question my beliefs for a moment or two especially when I got to meet the reindeer. 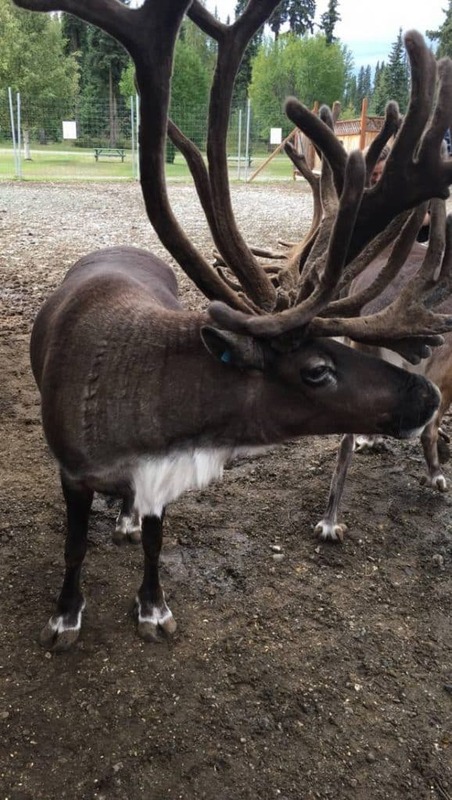 It’s a separate part to Santa and Santa’s House (full of candy and decorations available for purchase), but you can pay a bit extra to go into the pen to meet & feed the reindeer. I am convinced this one was Rudolph in disguise. Their antlers are a force to be reckoned with though and although they are docile and used to people, they don’t necessarily know where their antlers go. It may be worthwhile to make sure you stay with the little ones while they are feeding the deer. One of the last things I got to experience in Fairbanks was something I was dreading as I’m not a car enthusiast, but I was delightfully surprised by the Fountainhead Antique Auto Museum at the Wedgewood Resort (where we stayed). 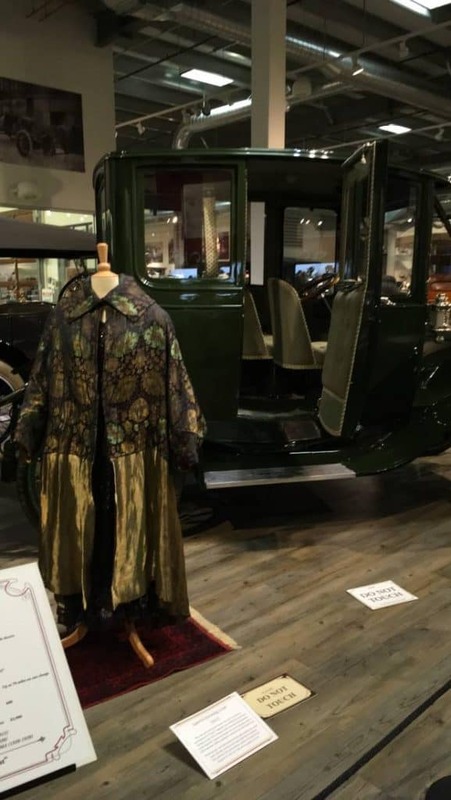 Walking around and looking at old cars isn’t normally my cup of tea, but when they paired it with vintage outfits so that I could actually visualise the people who used to drive them it made for a completely different experience. The owner took us through the gallery and explained that his wife loves vintage clothing and is especially fascinated with the Roaring 20’s. She was the one who went through and paired the cars with the outfits and admittedly, I probably loved the outfits more than the cars. It was so different from other car museums that I’ve been to in the past though that I would highly recommend it to anyone visiting Fairbanks. After a gruelling couple of days in Fairbanks, we headed south on the Alaska Railroad Denali Star Train and got to relax for 9 hours. We were spoilt with the Gold Star Service which includes seats on the glass dome car, meals, and 2 complimentary adult beverages; the view alone made it worth it in my opinion. As we made our way from Fairbanks past Denali National Park to Talkeetna the landscape changed from urban warehouses to vast landscapes lined with fir trees, lakes, waterfalls, and mountains. In comparison, it is very much like what I would expect out of the Rocky Mountaineer so it could be a good alternative for people wanting to do that. Once we arrived in Talkeetna I was a bit disappointed by the fact that we didn’t actually get to stop in Denali. For a good few days on the trip, I didn’t realise that Denali is the former Mt. McKinley which I had always learned about in school as being the tallest mountain in the US. It seems there was good reason for the name changing back to Denali and I feel that when I asked about it I may have hit a bit of a sore spot. The person I talked to had explained that it should have never been named Mt. McKinley in the first place since it was named after a president that had never even stepped foot in the state. 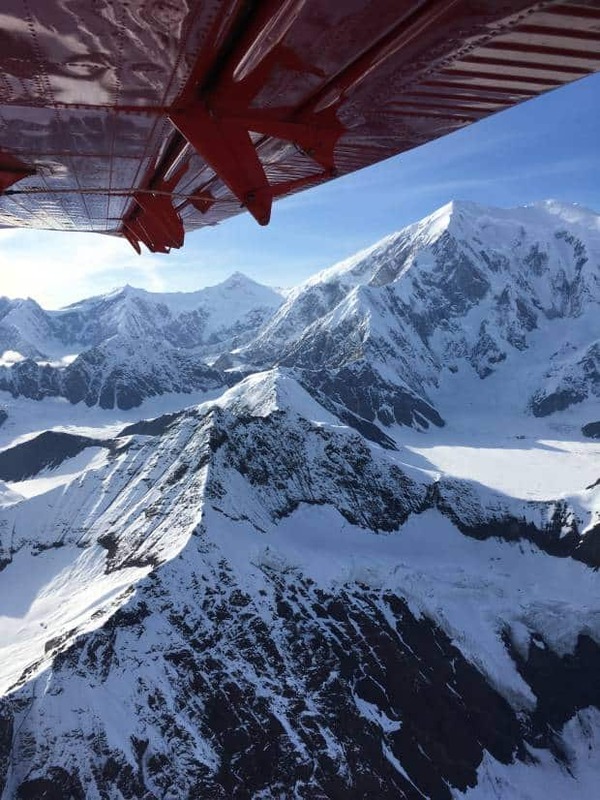 My disappointment was in vain though because as soon as we arrived we were greeted by K2 Aviation who took us straight from the train to their tiny airport for a chartered plane ride through Denali National Park. Although I was terrified of small planes, this is one thing that I certainly would have regretted had I not done it. 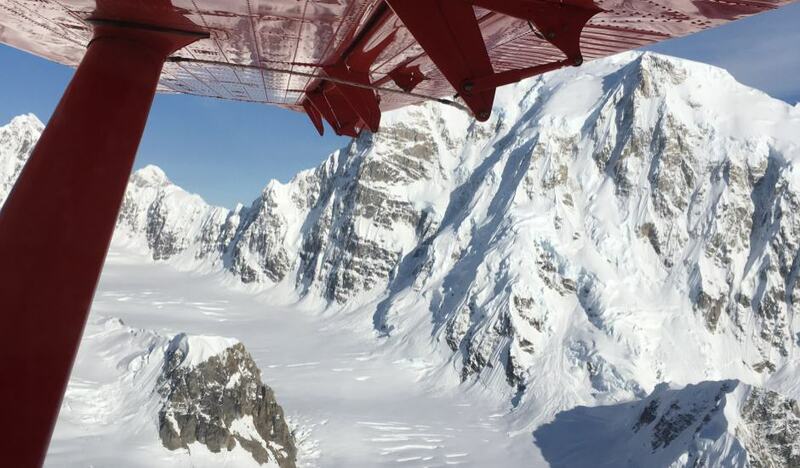 We were told that a glacier landing was originally planned, but the weather wasn’t ideal so we were just doing a flyover in a De Havilland Otter. 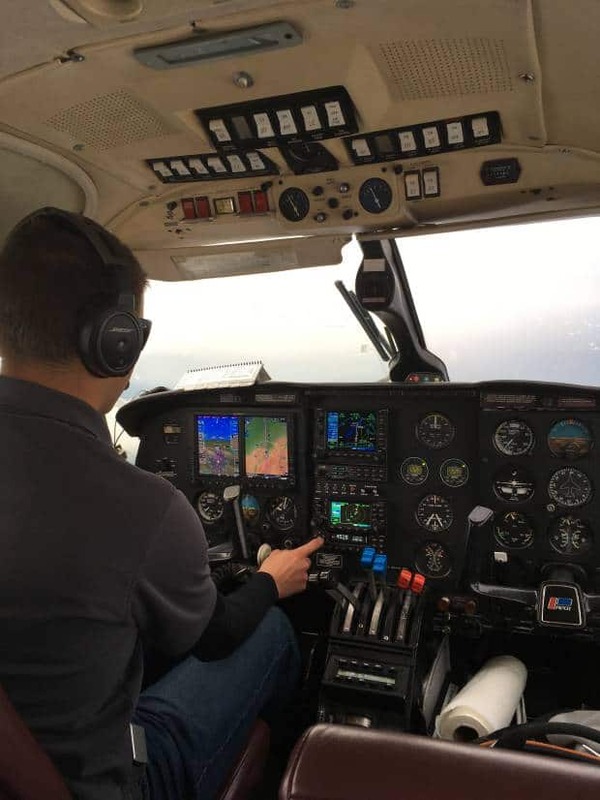 When we got up in the air and we passed over the greenery, I thought to myself “yeah, I can do this…just going over the park and woods” but then the scenery changed and next thing I knew we were up with the glaciers circling and weaving through mountain peaks. Even with my hesitation though, I quickly calmed myself when I saw the views the mountain was putting on for us. It was impossible not to be impressed by the sheer majesty of the views. I would highly recommend it to anyone travelling to Talkeetna or Denali. After we came down off of our adrenaline high, we headed to Talkeetna town for dinner and drinks at the Denali Brewing Company. I’d already heard of the company by being in Alaska for a couple of days already since their craft beers are well-known throughout the state, but I wasn’t expecting for such a known product to be from such small roots. The dinner was in the room where they started their brewery several years ago and it was amazing to be treated to the history of the company (and of course, the delicious food). Part 3: Anchorage, Alyeska, a blueberry festival, and otters! After an amazing night in Talkeetna we packed our bags and headed 2 hours south to Anchorage. 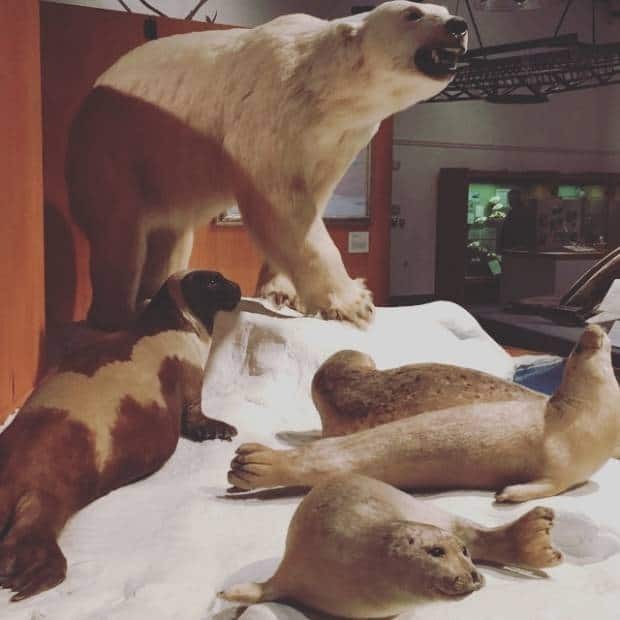 Once we arrived in Anchorage, not a moment was wasted as we went straight to the Alaska Native Heritage Center where we learned even more about the native Alaskan life and more specifically about the different tribes and lands. We had a guide who gave us a very brief tour of the lands, but the centre featured different areas dedicated to each region of Alaska so you could get a better idea of how each tribe had different ways of life. Our tour was a bit on the short side so I don’t feel that I got to fully experience everything the centre had to offer, but I will go back if I get the opportunity to make my way to Anchorage again. For lunch, we headed toward a hotdog stand in the city centre. Once we arrived we soon realised that these weren’t your ordinary hotdogs when we saw the “reindeer” on the front of the cart. It wasn’t just a funny name for a regular hotdog unfortunately, it was actual reindeer meat. After having spent some time with them a couple days before, I couldn’t bring myself to try it but other members of the group did. They likened it to venison; a bit gamey but otherwise tasty. While our food was digesting, we hopped on board an Anchorage Trolley Tour which gave us a fantastic overview to the sights of the city. The highlights for me were learning about Earthquake Park (aptly named after the devastation of the 1964 9.2 magnitude quake) and finally seeing a moose! It was a goal of our group to see wildlife actually in the wild and we all found it ironic that after all the time we spent on the train, in Fairbanks, and in Talkeetna that it took until we were in the city to see a moose. Regardless, the moose and its baby became instant Instagram stars. After the excitement of seeing a moose, we took the coastal highway to Girdwood where we were spoilt by the beluga whales cascading through the waves. Our first stop was the Alyeska Resort where the blueberry festival was taking place. All of us had done our due diligence by researching the hotels we were staying at, but none of us were expecting what we got- the website simply did not do it justice. The Alyeska Resort doubles as a ski lodge in the winter; during the summer they host things like the blueberry festival that we had all been looking forward to. 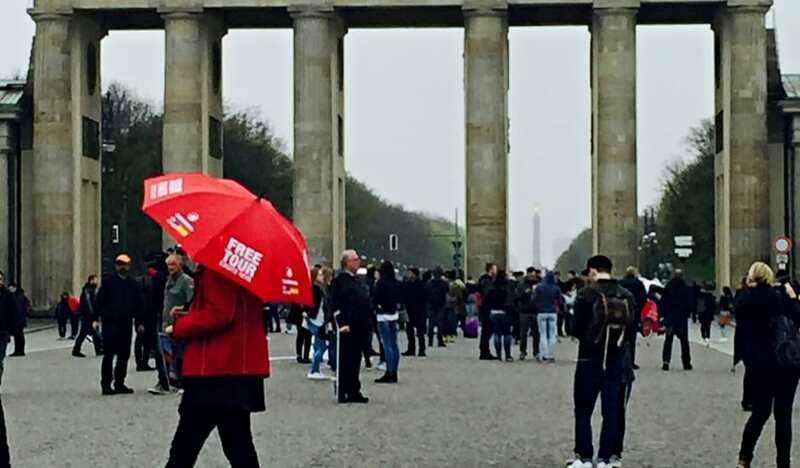 The day was bleak and rainy so rather than have a group visit to the festival, we were given the afternoon free and it just so happened that none of us could keep away from the festival. It was a token of Americana that we had all wanted to experience during our trip; the paths lined with vendors selling anything from paintings to food (lots and lots of blueberry treats to choose from) and a band that played the likes of Lynard Skynard under the marquee. Once we were all blueberried out, we were treated to dinner on top of the mountain at the Seven Glaciers Restaurant in the resort, an AAA Four Diamond award winning restaurant complete with views complement your meal. Getting there is not for the faint of heart or for anyone who is afraid of heights as the only way up the mountain is by a large sky gondola which takes about 7 minutes and goes high enough for your ears to pop. 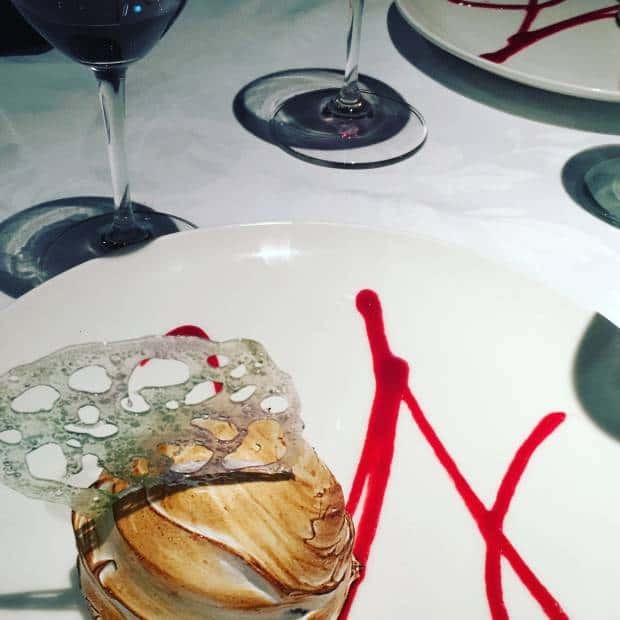 If you can overcome that though, then the food is some of the best I’ve ever had- Alaskan king crab legs, Alaskan Salmon, and their specialty dessert, the Baked Alyeska. Well worth the visit not only to the resort but also to the restaurant. After one of the best sleeps that I had on the trip, the next morning we headed to Whittier where we joined Lazy Otter Charters on a cruise through Prince William Sound. If Whittier sounds familiar, that is probably because it is a stop for Princess Cruise Lines itineraries (and Carnival, I believe) through Alaska. Getting there otherwise, once again, not for the faint of heart because it is through a nearly 3 mile long one-way tunnel. The tunnel itself is only open to traffic in each direction every half hour, so when you’re heading into Whittier you will want to stick to a strict schedule otherwise you may find that you have spent a half hour or more waiting at a stop light. The tunnel is narrow and dimly lit with little ventilation, so safety rooms are scattered throughout. In case of an accident, leave everything behind and head to a safety room. The cruise through the sounds was what I was waiting for when I pictured Alaska. It was a rainy day, but I wouldn’t have had it any other way. The boat took off and the first stop was to a fishery where the wildlife was running amuck, all enjoying a good morning feed on the salmon. From the comfort of the boat, we saw sea lions, several bears, seals, and an otter! As if that wasn’t enough though, we continued further into the sound and were met by icebergs and glaciers. Despite it being summer, the hooded parka I was wearing was a necessity. Others weren’t as prepared and they definitely suffered for it. After the cruise, it was then off to the Alaska Wildlife Conservation Center which I had particularly been looking forward to since I grew up with animals and wildlife. It did not disappoint; here they were rehabilitating animals injured or orphaned in the wild and had everything from bears to a wolf that was having a ball howling back and forth with a dog in someone’s car. It was a drive through set-up, but you could also stop and walk around if you so choose. After the conservation center, we then said farewell to Alaska with a final dinner and farewell event. After recovering and relaxing, it was time to say a final goodbye to the US. It was short, but sweet and exhausting, yet exhilarating. I’m looking forward to sneaking another trip to Alaska into one of my other trips to the US to show friends and family the wilder side of the country. All in all though, I would highly recommend it to anyone wanting something different from the usual USA. Laurel travelled with Brand USA, all her opinions remain her own. Laurel Rietveld first started travelling when she was studying in Uni after a short study abroad programme went horribly wrong and turned into a 7 year venture living and working in the UK. She has held various jobs such as a freelance poker journalist and a movie casting studio assistant. Originally from the USA, she loves to get back to her home country to visit Disney Parks religiously and see family. When she’s not giving all of her money to a giant mouse, she also explores her new home in the Upside-Down (aka New Zealand) and the surrounding islands including Australia.